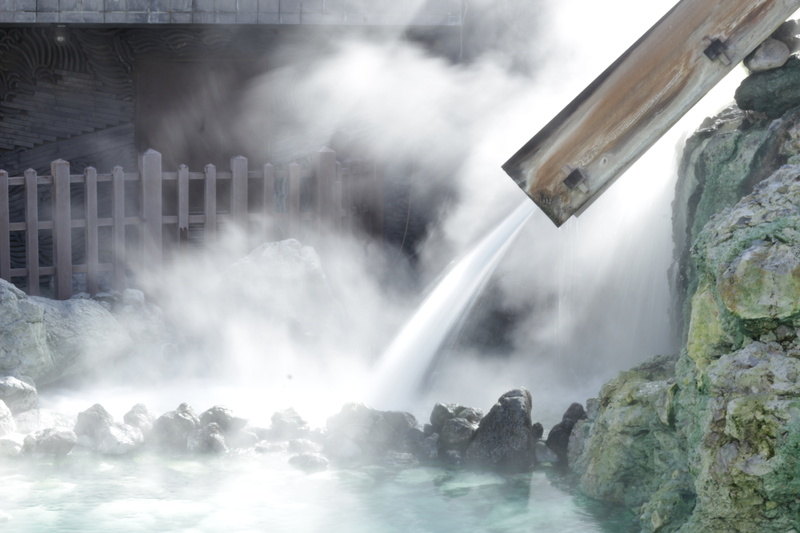 Celebrated by philosophers, painters and high-ranking gentry as a haven of Japanese culture, wellness and healing, the onsen town of Kusatsu has drawn visitors for centuries. Due to its unique positioning beneath the tip of Mount Shirane, within 90 minutes the resort’s flowing hot springs provide enough scalding water to fill an Olympic-sized swimming pool. 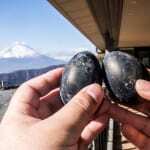 The yubatake, the eminent hot water field at the center of town, is the resort’s main source of hot spring water, which is also Japan’s most acidic, with a Ph level of 2.1. Discover Kusatsu’s atmosphere and romance the same way as our predecessors, by slapping over cobbled streets wearing wooden geta sandals and yukata – available at most hotels. Reminiscent of what the artists, poets and scholars of 19th century France called Le Flaneur, Kusatsu is best explored by wandering without aim. 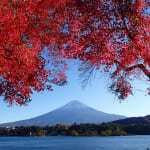 After a four-hour bus ride from Shinjuku Station, you’ll arrive in Kusatsu with the sole purpose of taking it slow. 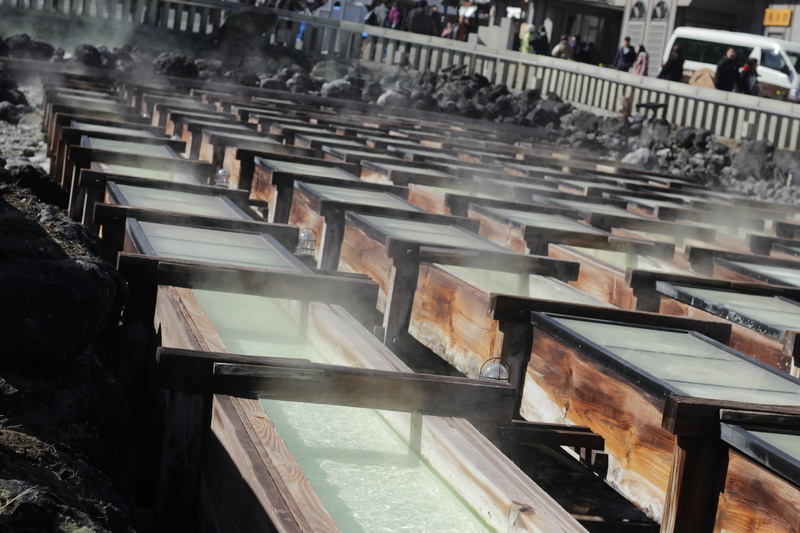 Kusatsu has a lot to offer and can be explored at ease within a three-day weekend. Take your time, have a nap, get a massage, and when properly unwound, strike out for your first wander. Just as locals have done for centuries, take a stroll to the yubatake, no more than a five-minute walk from most hotels. Networks of wooden aqueducts and waterfalls transport the scalding hot waters between green and blue pools, clouds puffing up in eggy sulphuric billows. Basho’s haiku (left) describes the sound of geta tapping across the wooden planks surrounding the yubatake, and folklore accounts say that Minamoto no Yoritomo, founder of the Kamakura shogunate, bathed here after fleeing from Taira clan warriors. For dinner, most hotels serve kaiseki (multicourse meal), but if you’re staying in a guesthouse or hostel, check out Iiyama Tei, a “pot-cooked rice bistro” that uses local vegetables. 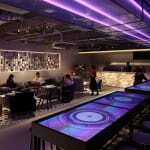 For late-night revelers, try Café Bar R, or head to Bar Choice for drinks and karaoke. Sitting in a hot bath, watching the rising sun filter through the steam, is a gentle way to start the day. 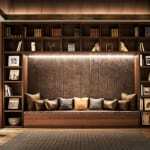 Aim for a hotel that has breakfast included as there are few breakfast-friendly cafés in Kusatsu. After your dip and breakfast, head back to the yubatake. Pick up a morning ticket at the traditional events hall, Netsu-no-Yu, for a folk-dance performance. Climb the tall staircase nearby to explore Kosenji, a Buddhist temple dedicated to the glory of Kusatsu’s onsen water. Kosenji is also home to a monument to Kobayashi Issa, an Edo-era haiku poet (see above) with a fondness for the area. When ready, relax next to the yubatake until the yumomi and dance performance begins. 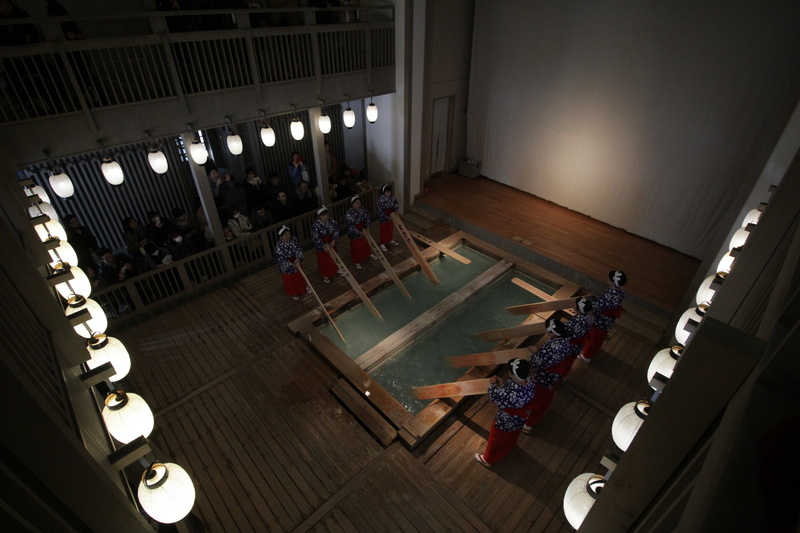 Yumomi is a historical method of cooling the water where patrons use long wooden paddles to stir and slap the water, singing folk songs to stay in time with each other. This activity was once a pre-bath warm up, especially as groups of bathers would synchronize their entry and exit, called jikanyu, so as to keep the temperature constant. Although a little touristy, the folk songs and yumomi carry an inherent cultural importance and the event is beautiful to watch. Standing on the second floor will give you a bird’s-eye view but by watching from the ground floor you can give yumomi a try, as guests are invited onto the stage to have a go themselves. Having taken in the unique bathing history of the town, it’s time to eat a Kusatsu local specialty – soba with maitake tempura. These mushrooms are fleshy, juicy and just about the only thing that can be grown in the surrounding mountains. 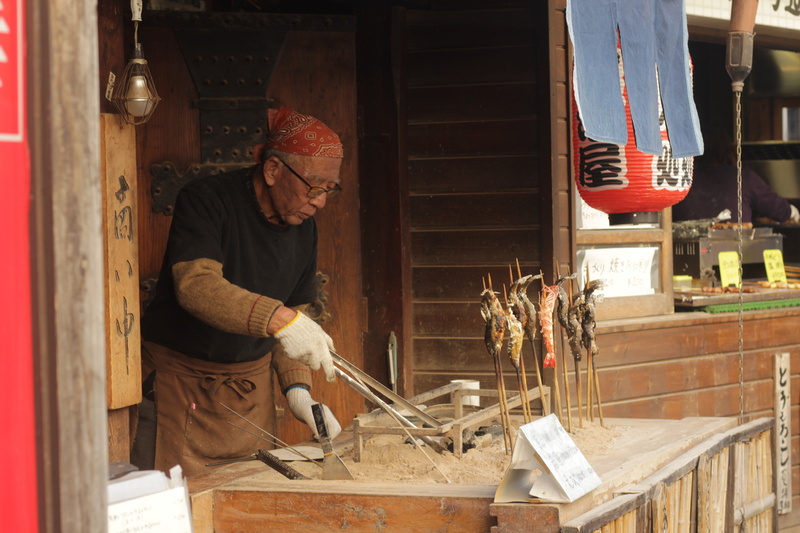 Many soba shops in Kusatsu make their own noodles, and you can see them laboring each morning through shop windows. Anywhere around the yubatake will serve this dish, but Teuchi Soba Aoyama, down Yutaki-dori leading away from the square, is locally revered. It always has a long line outside, but it’s worth the wait as there is an English menu available. Post-soba is the perfect time to explore without aim through the lanes and alleyways of the town, especially as midday marks the time when weekend trains and buses arrive. 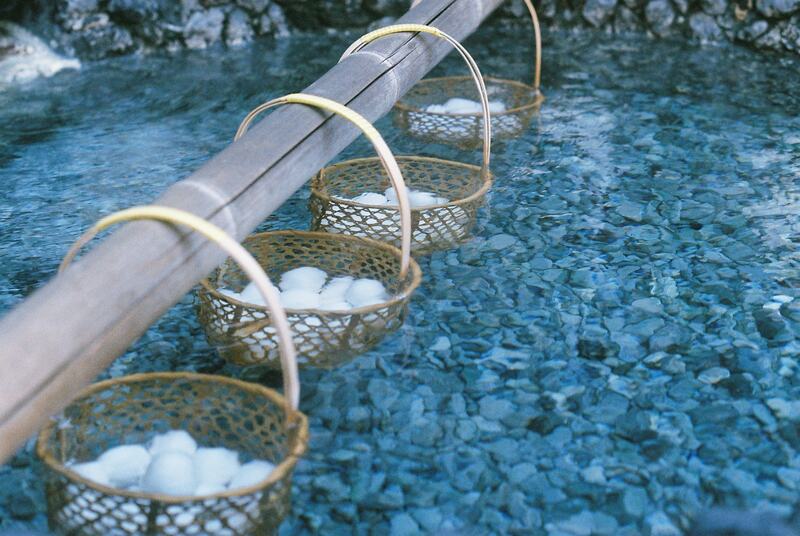 Roam around to discover hidden footbaths, shops, crafts and tasty onsen manju buns. Most of all, get a feel for this unique city in the winding backstreets and conjoined houses. If you’re in the mood for something other than kaiseki for dinner, try some yakiniku at Shitatsuzumi. Walk off your meal by taking a turn around the yubatake. 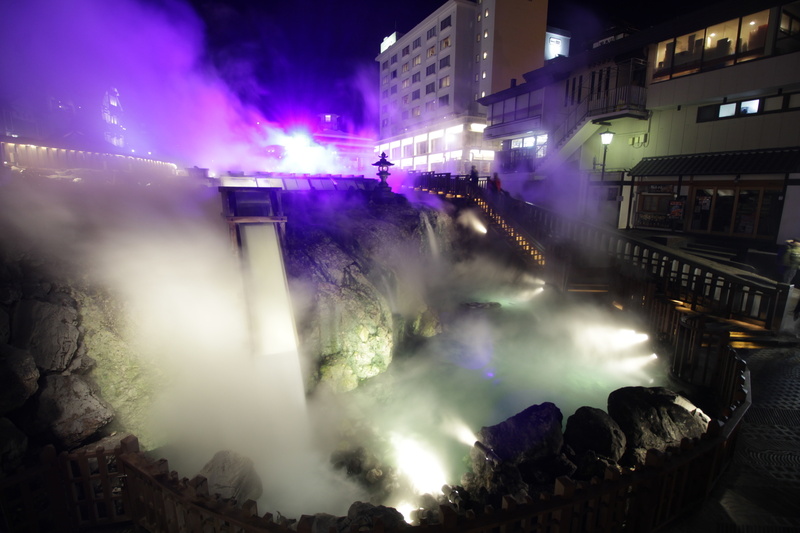 At night the grand water feature is lit up with different colored lights, and the cold air makes the boiling onsen water billow with clouds that swallow and release people at will. Once breakfasted and soaked, check out and store your bags for a final day of wandering. Explore the wooded forest path overlooking the roofs of Kusatsu by heading to Shirane Shrine by way of Nikkoji Temple. The bustle of the town doesn’t quite reach this strangely quiet and peaceful path dotted with monuments to poets and famous visitors. Come down the perilously steep staircase to lively Yutaki-dori. 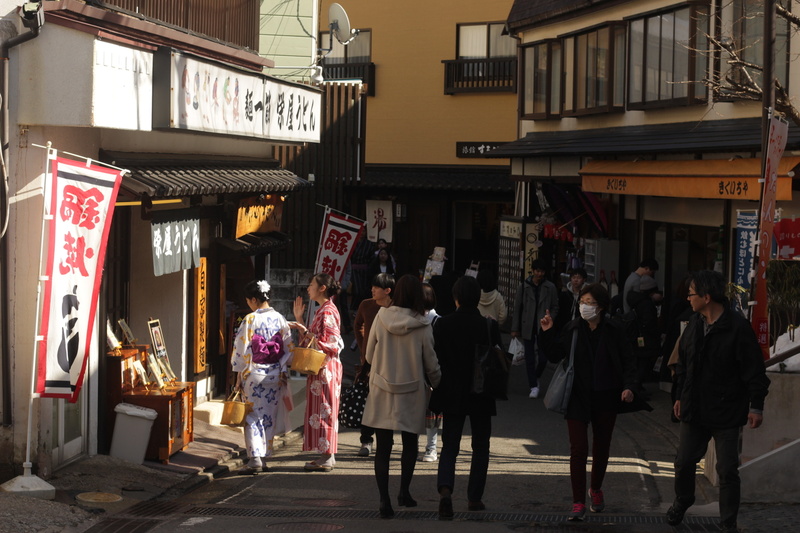 This street is a treat for shoppers, snackers and the curious, who can find manju, onsen tamago (an egg boiled in onsen water), shioyaki (salted fish on sticks), souvenirs, and impressively enough, handmade glass. Follow this road up to Sainokawara Park where you’ll find naturally occurring, overflowing pools and a river of pure blue water. Take some time to relax over the footpaths and pop up the torii-lined stairway to Anamori Inari Shrine. At the end of the park you’ll find Sai-no-Kawara Outdoor Bath, a rudimentary set of baths with no showers, hairdryers or relaxation room. It’s stripped of everything but the bare basics. The expansive outdoor pools, surrounded by snow-covered mountains, make up the largest outdoor onsen in Japan. However, the towels are expensive so bring your own. Men should also be aware that there’s a pretty revealing view awarded to anyone who walks along the adjacent mountainside path. For lunch, take a stroll back to town to Café Gute Reise for a light snack and excellent coffee sourced from all over the world. If you have a sweet tooth then try the maple and almond cheesecake. 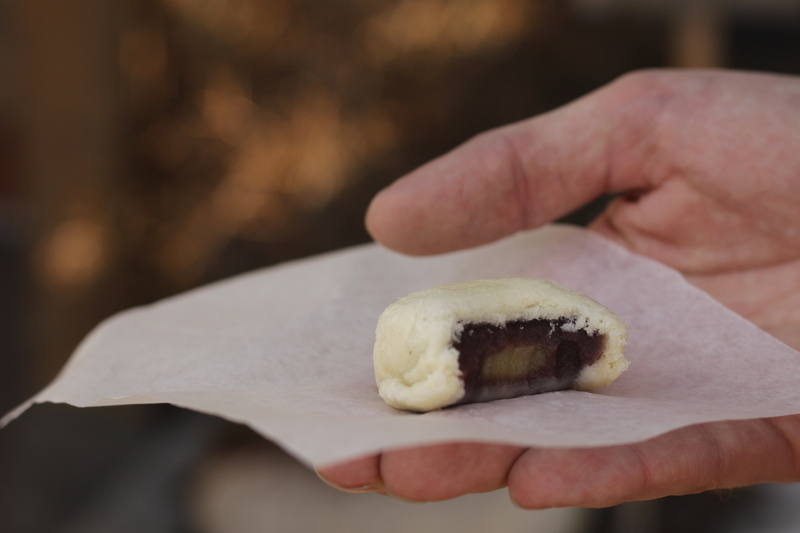 As your departure time is likely nearing, stock up on treats for the journey home at Kogomipain, which uses onsen water and domestic flour to bake its goods. Take one last turn about the yubatake before picking up your luggage. Having indulged in a weekend of good food, hot sulphuric water and walks along the charming streets of Kusatsu in the style of bygone Japanese gentry, it’s time to return to Tokyo, your journey a little easier than it would’ve been in the Edo era.